Mustgo is my favorite thing to eat. You know, this must go, that must go. I have a few meals in my collection that really don’t have much of a recipe because it changes depending on the odds and ends I have in my fridge. This is one of those. Requirements are some sort of leftover grain, I do prefer rice. Some vegetables, and, to really make it a meal a bit of vegan chicken and sweet chili sauce. This is one of my pregnancy cravings for sure. I think I made it every week for a month straight and ate it two meals a day until it was gone. Just thinking about it I feel like I should run out and get some Trader Joe’s Chicken-less strips and make it for dinner. I do make the fried rice part a lot without the chicken, but it really takes it to a new level. I have to thank my friend Tatum for this idea as it was something she introduced to me back in grad school. The chili-vegan chicken part that is. Add a little oil, and whatever vegetables you like to cook the longest (onions for me), saute a few minutes, then add the next (mushrooms, zucchini, and greens). Cook until just tender. Meanwhile, heat a smaller skillet over medium heat. Add a little oil and the vegan chicken cooking, stirring frequently, until browned (3 -5 minutes). 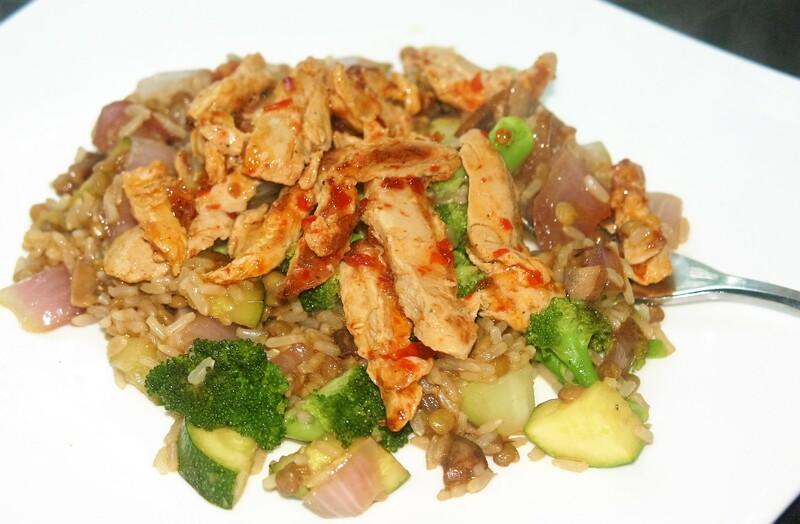 Turn off the heat, drizzle with sweet chili sauce, and stir to coat the “chicken”. Add rice to the cooked vegetables and cook a bit more to heat the rice through. Drizzle with 2 TBL olive oil, the tamari, a little salt, and the lemon juice, stirring to combine. Top with cooked chili “chicken” and enjoy!